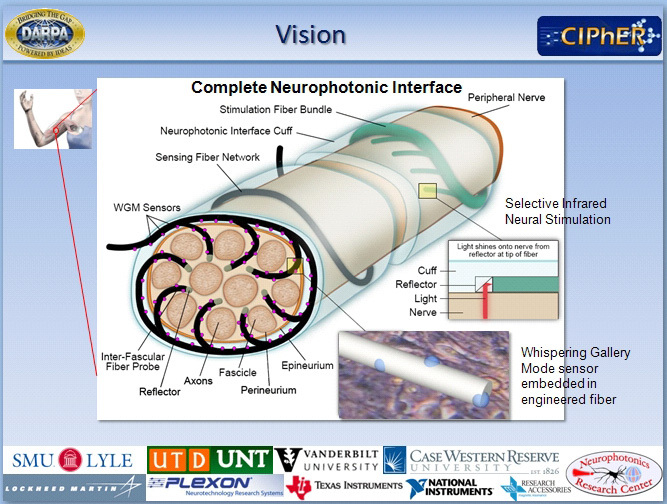 Funded by a Department of Defense initiative dedicated to audacious challenges and intense time schedules, the Neurophotonics Research Center at Southern Methodist University will develop two-way fiber optic communication between prosthetic limbs and peripheral nerves. This connection will be key to operating realistic robotic arms, legs and hands that not only move like the real thing, but also “feel” sensations like pressure and heat. Successful completion of the fiber optic link will allow for sending signals seamlessly back and forth between the brain and artificial limbs, allowing amputees revolutionary freedom of movement and agility. Partners in the Neurophotonics Research Center also envision man-to-machine applications that extend far beyond prosthetics, leading to medical breakthroughs like brain implants for the control of tremors, neuro-modulators for chronic pain management and implants for patients with spinal cord injuries. The center brings together researchers from SMU, Vanderbilt University, Case Western Reserve University, the University of Texas at Dallas and the University of North Texas. 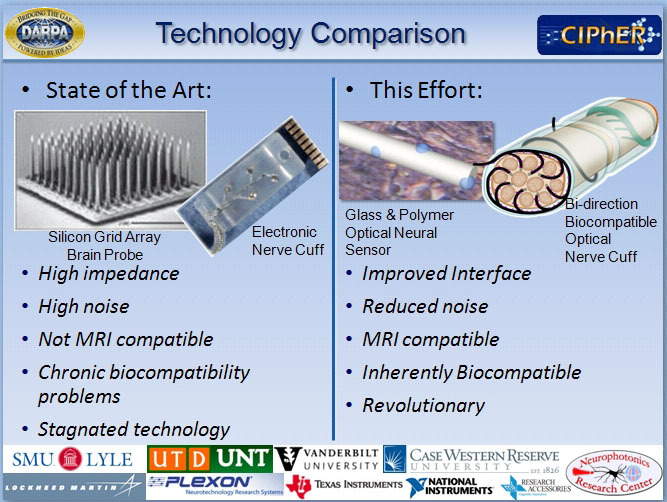 The Neurophotonics Research Center’s industrial partners include Lockheed Martin (Aculight), Plexon, Texas Instruments, National Instruments and MRRA. Together, this group of university and industry researchers will develop and demonstrate new increasingly sophisticated two-way communication connections to the nervous system. Every movement or sensation a human being is capable of has a nerve signal at its root. “The reason we feel heat is because a nerve is stimulated, telling the brain there’s heat there,” Christensen said.